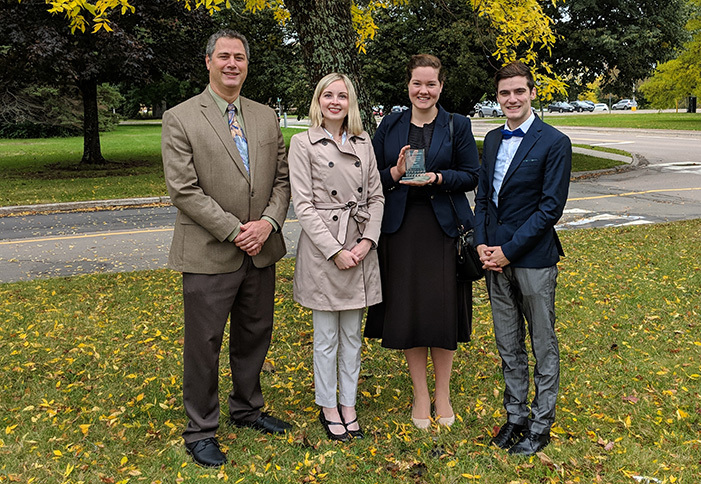 A team of students from the UNB Saint John faculty of business won second prize in the 2018 Atlantic Schools of Business case competition over the weekend. With eight teams competing in the undergraduate competition, students were given a case to develop a business plan to launch a profitable malting operation in New Brunswick at noon on Friday. All teams were required to communicate their solutions to the judges the following Saturday morning in a 15-minute presentation. The 48th annual event was hosted by Universite de Moncton and is one of Canada's longest running academic business conferences. Photo: Team coach Dr. Matthew Wegener with students Taylor Lee, Belinda Goodine and John Wolno.